Popular Nigeria Big boy and CEO of Mompha Bureau De Change, Mr. Smith Kings, rejoices as he welcomes another beautiful child into his world of luxury, surplus and comfort. The Bureau De Change MD announced that his wife has successfully delivered a bouncing baby girl at California hospital in the United states on 31st Of January. "Mompha", as he is called by friends has expressed gratitude to God for the gift of a third child, as he receives countless congratulatory messages from friends, family members and partners to celebrate the newborn baby girl. 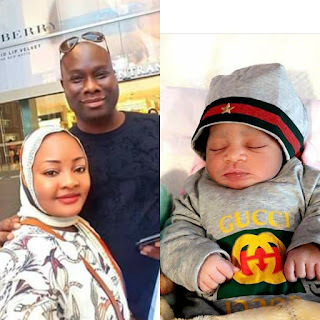 According to a post on his Facebook ID Mompha, he has called on his fans to advice him on the appropriate gift and gesture to present to his wife, for the safe and successful delivery of their daughter. Mr. Smith is one of the biggest lions, with a charisma that describes nobility, demonstrates intelligence and defines splendour. He has remained famous for his display of wealth and a life of absolute luxury. He is also known for his abled impact in promoting youth empowermemt by supporting raw talents, both in Nigeria local leagues and street soccer across Nigeria. As a passionate football lover, and a dedicated empowerment pathfinder, Mr. Smith has continued to encourage young local footballers, both in funds and otherwise to further the achievements of their dreams abroad. Mompha will be celebrating the birth of his daughter with family members, friends and well wishers from across the world, though a date is yet to be decided for the grand celebration. However, Mompha has thanked and appreciated everyone who congratulated himself and his wife, as well as those who prayed and threw good wishes at their new baby.